So far, we've been using J in an interactive mode, perhaps saving interim results in variables. When we end the session, our work goes away. Typically, however, we'll want to define a verb as a series of programmed steps, and have these verbs invoke one another. And we won't want to redefine these verbs from scratch every time we use them, meaning we'll want to save our code in persistent files. The interactive execution window is where to test fragments of a longer program, which, once debugged, may be copied to a text window and saved as a runnable file. When the file is run, the operators it defines (verbs, adverbs, nouns, conjunctions) will become available to us in some locale (more on locales another time). For example, suppose we'd like to compute the Bernoulli numbers. Several algorithms are available, including one based on the above expansion of (x + 1)^n. So one strategy is to collect our Bernoulli numbers in a list, and to use (x+1)^n, with n increasing, to generate the coefficients. Each step of the way, we'll use all our Bernoullis so far, with the binomial coefficients, to generate the next Bernoulli. What we need to do is multiply all coefficients after _9 by the Bernoulli numbers collected so far. Then add the resulting terms and multiply by 1r9. This will give our next Bernoulli number, which we prefix to a growing list. If you've programmed before, your eye will likely pick out the looping structure, bracketed by the while and end statements. Automatically, J assumes y. is the name of the verb's right argument, which in this case is named bernoullis. Were this a dyadic verb, the left argument would be named x. (again, J simply assumes this). Asking for bernoullis 10 at the command line will initialize y. to 10. After a couple of variable initializations, the loop begins. It contains a decrement-by-1 statement: y. =. <:y. so that each time through the loop, y. gets smaller, and at zero, finally fails the y.>0 test (part of the while statement) and escapes the loop. The first parenthesized expression takes element 1 of coeffs. Given zero-based indexing, this would be the 9 if coeffs were as shown above. This element (9) is then reciprocated (%) and negated (-), giving _1r9. The result is in rational format because our coefficients were initialized as x: 1 1 before the loop started, meaning all subsequent polynomial multiplications have continued to use extended precision format. The second parenthesized expression uses dyadic curtail (}.) to take all but the first two elements of coeffs, i.e. in this case: 36 84 126 126 84 36 9 1. These terms are multiplied by the corresponding eight elements in bns, and the results are summed (+/). Both of these expressions are then multiplied together, giving our next Bernoulli number b. This local variable b is then prefixed to bns in the next line, y. is decremented by one (<:), and the loop begins another iteration. When we finally escape the loop, bns is what gets returned by this verb (whatever is on the last line constitutes the return value). bns contains a list of Bernoulli numbers in reverse order, i.e. the last Bernoulli computed begins the list. Note that odd-indexed Bernoulli numbers are 0, after the first, which is _1r2. Also in need of explanation in the above programs, is the use of the number 3, or the expression 3 : 0, at the outset of a verb's definition. This 3 is one of four possible values, 1, 2, 3 or 4, and it refers to the part of speech that's being defined. 1 signifies an adverb, 2 a conjunction, 3 a monadic verb with an optional dyadic meaning, and 4 an exclusively dyadic verb. The : 0 after the 3 indicates that the rest of the definition follows on subsequent lines, until a concluding right parenthesis, alone on a line, is reached. In place of this 0, the complete definition enclosed in single quotes, may be provided on a single line. This was the approach taken in our definition of bernoulli. What might we do with Bernoulli numbers? This sum may be expressed in terms of the 5th Bernoulli polynomial, the coefficients of which are comprised of the first five Bernoulli numbers weighted (multiplied) by the binomial coefficients k ! 5 (k=1...5). The polynomial we seek, giving the sum of the first n-1 consecutive integers to the kth power, is comprised of the k terms of the k+1 Bernoulli polynomial, multiplied by 1/(k+1). A prefix of 0 ensures that our coefficients align with corresponding powers, i.e. the last term aligns with n^5. And if the question were about consecutive integers to the 10th power, we would use Bernoulli numbers to get the coefficients of the 11th degree polynomial, and so on. Suppose we'd like to accomplish this step of building the summation polynomial in code. For example, if we wanted the polynomial for the sum of k powers of n-1 consecutive integers, we could say pk =: k sumpoly and then evaluate pk, already a polynomial. This is a case of defining a noun-modified verb (a kind of adverb) to return a tacit verb. Although the last expression above makes it looks like sumpoly is just a dyadic verb, it's really not, as 4 sumpoly wouldn't be a legal expression if it were. The purpose of sumpoly is to bind the appropriate coefficients as the left argument to the polynomial verb. Remember that & means "bind" or "curry." The m. is optionally used in place of x. in the definition of sumpoly in order to specify that sumpoly expects a noun for a left argument -- an exception will be raised if something different is passed. The arguments m. and n. stand for left and right nouns, while u. and v. stand for left and right verbs. x. and y. stand for left and right arguments of whatever type. J knows how to generate the Taylor expansion of many primitive functions. The Taylor expansion of f(x) is a polynomial of increasing powers of x with rational coefficients. Deriving this polynomial involves taking successively higher derivatives of f(x) around f(a). We call it the Maclaurin expansion if a=0. 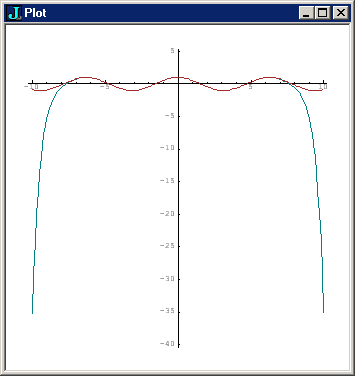 The graph below shows the cosine curve (red) plotted with the curve generated by the first 10 terms of the Taylor expansion of cosine (green). 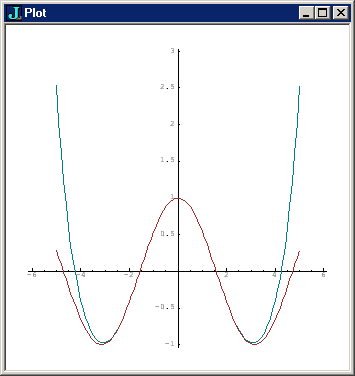 This next graph shows the cosine curve (red) plotted with a Taylor expansion of cosine to 15 terms. Notice the curves coincide over a much broader range (note also the difference in scale between the two graphs). The Bernoulli numbers may be generated from the Taylor expansion of the function f(x)=x/(e^x - 1), where e is Euler's number. In J, this f(x) could be written as the verb (% ^ - 1:) where 1: is a function that returns 1 no matter what the argument. The verbs _9: through 9: have been provided as a convenience. What the above lines demonstrate is the the coefficients of the Taylor expansion of x/(e^x-1) are the Bernoulli numbers divided by k!, e.g. _1r30, the fourth Bernoulli number, divided by !4 (i.e. 4! ), is _1r720, the fourth term (counting from 0) in the Taylor expansion. This pattern of k! occuring in the denominator of a Taylor expansion is part of its definition, and the verb t: (note colon), produces what's called the "weighted Taylor" expansion, meaning successive terms 0...k are automatically multiplied by k!. So t: gives us the Bernoulli numbers directly. Given we have direct access to the Bernoullis in this weighted Taylor expansion, it might seem that our earlier algorithm based on binomial coefficients is redundant. However, you'll discover that finding the 100th Bernoulli number using the Taylor expansion takes significantly longer than the binomials-based approach. However, J does come with a module (./system/packages/math/numbers.ijs) which includes a Bernoulli numbers algorithm that's faster yet, based in turn on so-called tangent numbers.